Please pay all money on Monday if possible. Lunch - $2.45 a day/$12.25 per week. Lunch can be paid by check or cash. Snack 1 is $.50 and snack 2 is$.75. Milk, juice and water are $.50 each. Parents and child guests are welcome to eat any day for $3.45. Reservations must be made by 9:00 a.m.
use this program if you think you may qualify. The information and application are in the student folder handed out at the time of registration. Lunch menus are published monthly and sent home in the Wednesday folder or via email. 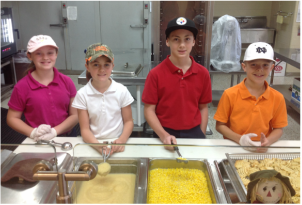 Lunches are served each day in the school cafeteria. Parents are encouraged to purchase meals for the upcoming month, due on the 1st of the month. Students should bring their lunch money/check to school in a sealed envelope with the student’s name and homeroom on the outside, and days eating. Make checks payable to Sts. Peter and Paul Cafeteria. Please contact Kathleen Ziliak, Cafeteria Manager, and Debbie Schneider, Cafeteria Asst. Manager, at stsppcafeteria@evdio.org or 812-768-6775. For more information, please refer to the school handbook.